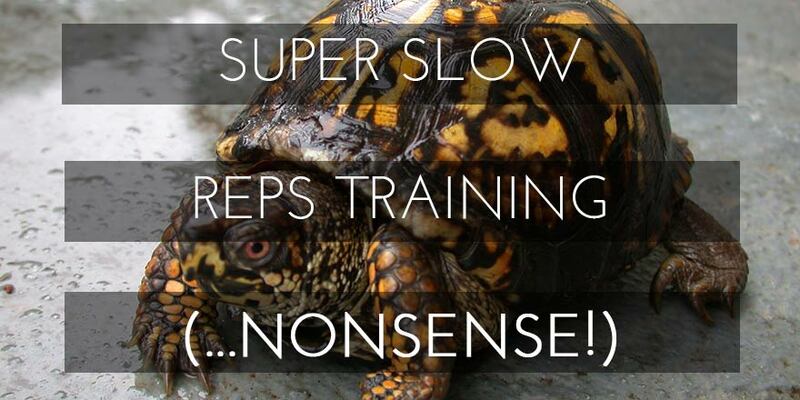 Super Slow Reps Training — Nonsense! There exists a common problem out there in the certification world and in online expertise. So many times people are just trying to learn too much too fast. The result of that is often a misunderstanding and misapplication of key concepts and training practices, tactics and strategies. Two of the most senseless approaches to gaining real-world muscle mass and development are “Heavy Duty” training and “Super Slow Reps” training. I’ve addressed both of these before as “myths” for anyone with average genetics or especially for trainees who are HardGainers. Today at the gym I was watching some poor young lad paying a personal trainer to put him through useless “superslow reps training” out of a book. However, there is a persistent belief among many personal trainers, some coaches, and even a few foolish exercise scientists, who say weight training exercises must be done slowly. A long time ago, some trainers and wannabe experts took that notion to the extreme and came up with the idea that if slow reps are good (which by itself, simply lacks context) then “super” slow reps would be the real secret to building a physique. The logic here is ridiculous. It takes one already mistaken notion and then expands on it to create a very ridiculous idea of a training tactic that violates basic principles of exercise physiology – in this case, the proper understanding of the “overload principle.” Principles are principles. They cannot be violated with “tactics” that make no real-world sense. In terms of superslow reps training the idea is that “time under tension” replaces the principle of overload in importance. Or more to the point the idea is that “time under tension taken to a ridiculous extreme” is true to the concept of overload stimulus and adaptive response. The only problem with this “faulty idea” is that it’s just not true. The intentional use of slow movement in weight training reflects an inadequate understanding of the nature of efficient power production, the physics of work, force production, muscle fiber recruitment, and even weight-room safety. A deliberately and artificially created slow reps training cadence increases the “time under tension” (how long the muscle spends in contraction), yes that would be true. And this then is thought to increase the amount of “work” the muscles do and the resulting amount of muscular development that can be gained. But this conclusion is simply NOT true. An examination of the physiology of power production, and rate of force production of muscles at work against resistance is necessary to understand this. Power is strength displayed quickly- the ability to explode against a resistance. High power production depends on the rapid recruitment of a maximum number of motor units to generate the high amount of force necessary to produce that power. More power requires an increased efficiency in the recruitment of high numbers of motor units and the quickness with which they come into contraction. In the interests of both muscle mass and power training, higher velocity works better. This can of course include a bodybuilder-like “pumping cadence” as well. In fact the bodybuilding “pumping cadence” should be the preferred approach in regards to execution of reps in a workout in order to build “mass with class.” And not to get off track too much here, but you can’t train with a pumping cadence if you are doing strength reps in range of 3-5 reps. Performing reps consciously and artificially super-slow defeats this purpose – activation potential of high threshold motor units so essential to force production and muscle development. Superslow reps execution flies in the face of understanding these principles. Now super-slow reps is not to be confused with “heavy loads performed under control.” When doing strength training, the closer a weight is to 1RM, the slower it moves; because you are now training absolute strength and these reps cannot be done anyway but slowly if it is YOU actually lifting the weight and not momentum, torque, and other neophyte mistakes so common to “trying to lift max loads.” But training within the strength curve of absolute strength reps (3-5) does not mean that lighter weights executed for higher reps that can be moved faster, shouldn’t be. “Deliberate and artificial” superslow reps training is a misinterpretation of “time under tension.” And it is a bastardization of a true understanding of force production, rate of force production, and recruitment and activation of high threshold motor units. It takes deliberate “maximum voluntary neural activation” in the concentric phase of performing reps to have a training adaptive response that will result in muscle hypertrophy and increases in rate of force production that will enhance long-term work capacity. The latter is what is essential if you want to “keep growing” and developing muscle from your training efforts. Most importantly for those you interested in muscle development, high numbers of motor units working at the same time means an increase in the actual amount of muscle tissue involved in the work. As more “high-threshold” motor units are recruited to generate more power through increased force production, more of the muscle fibers in the muscle go to work. This is what you want if you want to build muscle – High threshold motor units are the ones that get recruited only by the highest level of stimulus, to produce the highest amount of force. This requires working against resistance with conscious execution of repeated concentric efforts that are anything but superslow! This uses more ATP that must be replaced through active metabolic recovery processes. Studies have found that longer duration repetitions with a longer time under tension actually demand less metabolic work when compared to fast-moving repetitions powered by higher numbers of motor units firing together. (I believe you can find numerous references to this in Rippetoe’s book Starting Strength.) This is because in artificially performed slow movements only the lower-threshold motor units are recruited and fatigued by lower-movement-speed exercise. Now, this is not all about just strength and power – power being strength expressed with speed. There are certain genetic limitations to someone’s capacity to be “powerful” even though this ability can be trained to a limited extent. But the truth is some individuals are just not terribly efficient at recruiting large numbers of motor units rapidly – some people are just not very explosive. But these same people can certainly build strength. And these same people can certainly build a physique. I know because I’m one of them and I built a world-class “mass with class” physique back in my day. And I was a classic example of “white man can’t jump” syndrome: Thankfully I had the great Bill Pearl as my mentor. I trained some of the best physiques in the world as well and to this day, I can tell you that I have yet to see a “mass with class” physique developed with “superslow reps.” I’ve never even seen one single world-class physique that I trained along side with, do even one single set of superslow reps nonsense. So, how DO you train? What’s the right “tempo”? Ever watch the original Pumping Iron? It’s on Netflix, currently. Every so often I turn it on, not to watch “the storyline” but I like to watch the training sequences. I advise you to watch it again, and tell me if you see one single training scene of anyone doing superslow reps. I love the scenes of Arnold doing front alternate raises, cable crossovers, Arnold and Ed Corney squatting for reps in the “sweet cadence” of “pumping to build.” There’s also Arnold doing T-Bar rows, there’s Ken Waller doing seated cable rows with the perfect form and pumping out the reps. The title of the film is well-chosen. It’s all pumping, pumping, pumping. No superslow reps can be seen anywhere by these guys hangin and bangin in real workouts. So much can be learned from just watching the training sequences from that movie – back in the 70’s – before fancy training equipment and before the rocket-science training pretension of online Gurus. Watching the training sequences in “Pumping Iron” should be part of a “Bodybuilding Training 101 Course” of how to do it RIGHT! All those physiques had mass with class, before the days of modern bodybuilders with wide hips and GH/insulin protruding guts. 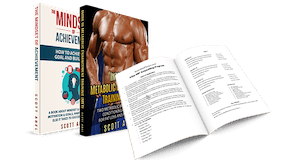 The real experts of how to build a mass with class physique – these experts aren’t forged in libraries studying research. They aren’t created by what Fred Hatfield used to call “Pencil Necks in lab-coats.” The real experts who leave a trail of “how to do it right” are the guys who have been doing it right for decades. And it takes decades under a ton of iron to learn what works. I was once speaking at a conference and multiple Mr. Olympia winner Lee Haney was speaking there as well. During a Q & A session, when asked what he thought about ‘superslow reps training’ Haney was quick to respond, “I doubt that whoever created superslow reps training has ever trained for an Olympia!” Great stuff! I feel sorry for the poor kid I mentioned at the top, doing his superslow one set of bench presses with a 10 lbs plate on each end of the bar. I want to walk up to him and his so-called “trainer” and advise them both to go watch Pumping Iron and learn something. Super-slow reps training? STOP THE NONSENSE AND GET REAL! …but as I always say: some of you will get it; some of you will not. The researchers suspect that the oxygen depletion in the muscle cells causes muscle enlargement. This isn’t the only factor, but it is a pretty important one. Oxygen deficiency causes the concentration of lactic acid in the blood to rise, and as a result the synthesis of anabolic hormones such as growth hormone and testosterone also increases. In addition, oxygen deficiency causes a temporary increase in the activity of free radicals in the muscle cells, as a result of which the compensatory training results in more muscle build up. Well once again I respectfully say this represents exactly what I’ve been talking about: that “research” is supposed to supplant real-world in the trenches decades of knowledge by experience. I’d like to weigh in here as well. Essentially what this excerpt is alluding to is the relationship between power (or at least the intent to move any implement with power) and how that can translate to selective recruitment patterns that allow an athlete/bodybuilder to tap into those higher threshold motor units most responsible for growth. Rapid changes of direction in force production and ballistic muscular contractions (97, 164, 206), comparable to movements in plyometric, speed, power, and agility training, have been shown to lead to preferential recruitment of fast-twitch motor units. These variations in recruitment order may benefit high-velocity power training in which time of force production is vital to success. For example, it would be very difficult for an athlete to generate enough angular velocity and power to attain maximal height for the vertical jump test if that athlete had to recruit the entire slow-twitch motor unit pool prior to activation of the fast-twitch units. Because the time between the countermovement and the subsequent jump takeoff is often less than 0.4 second, there simply is not enough time to recruit all of the motor units in order and still be able to perform an explosive jump. Thus, selective recruitment appears to be a beneficial intrinsic neural mechanism favoring explosive exercise. In addition, specific training may enhance selective recruitment, which may improve sport performance (165). This particular example proves how doing something in slow motion may give the person more “time under tension”, but certainly would lead to decrements in performance as it would certainly limit his power, and therefore his vertical leap. Good article as always Scott. Love the Pumping Iron example. Seeing those classic bodybuilders showing dedication in their craft always gets me motivated to do better!